At last! 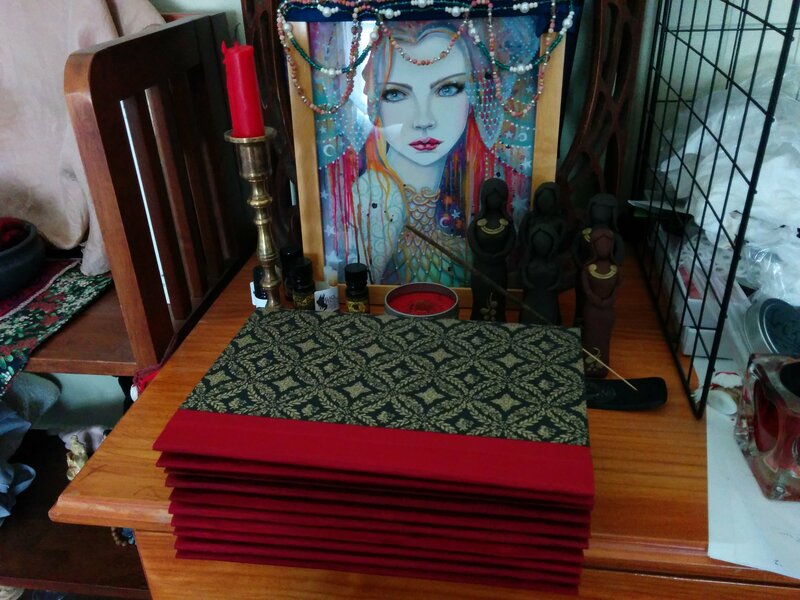 The first several hand bound books have been taken to the post office. The remainder will be taken on Monday. The dedication rite was also held this morning (here you can see a partial stack just before the candles were lit; there really are a lot of books). Getting these in the mail felt wonderfully conclusive. This project is very nearly over – at least, the physical aspect of it. These particular books will go out to do their work in the world and that’s exciting to think about, though they’re also beginning to leave my sphere of awareness just like any completed spell does. Of course, the process of bringing the entire Worshiping Loki project into being is only partially completed. Next I’ll be working with a print designer to prepare the standard issue copy; some of the design work will also have an impact on the electronic copy, which will be released at the same time, I expect. I’ll keep you updated as these upcoming stages develop. There are actually a few copies still available; there was a special price associated with the pre-order period, but that’s all. 🙂 They’re $55 + $3.50 US shipping (I can calculate international shipping, too). If you’d like to order one, just email me at salinespirit@gmail.com with your Paypal email and shipping address. You did awesome job on it! I know think or two about bookbinding. My mother worked in the shop, so I’ve seen the process. I refused to follow that trade when I was 15 years old. Then I ventured in it later, as to prove I could do it just don’t want too. You did beautifully, nice and clean work, and it is a lot of work done! Thank you so much! Making books by hand has been such an amazing educational journey. As I put each of the final books together I’m never quite sure if it’s going to be successful after it comes out from under weight. I still have so much I’d like to learn about this art; with any luck I can enroll in a book arts course at a nearby university next year. I want to keep getting better.